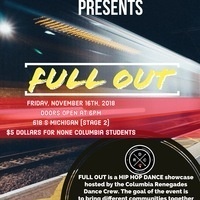 FULL OUT is a hip hop dance showcase hosted by the Columbia Renegades Dance Crew. The goal of the event is to bring different communities together that share the same passion, dance. FULL OUT will feature many different local dance teams, from Columbia College Chicago, to UIC, to the South Side of Chicago.